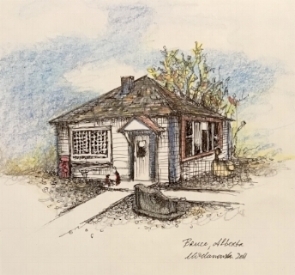 The little schoolhouse studio in Bruce, Alberta. Hello and welcome to e.t designs owned and operated by Ellen Thomson, Silversmith. I am co owner of Egress Studio trademarked under The Precious Metals Act with the Canadian Intellectual Properties office. Working from a studio which is a vintage one room schoolhouse in Bruce, Alberta, Canada, I produce handcrafted jewelry made of sterling silver, a precious metal consisting of 92.5% silver and 7.5% copper. My pieces incorporate hand cut and polished rock work by Izabela Ciechanowska, hand blown glass, interesting beads and other rock, minerals and semi precious gems collected over the years. These processes have created a passion in me for the beautiful and abundant treasures that the earth has to offer. Most pieces are completely one-of-a-kind while others can be produced again. My work can be found in the Alberta Legislature Store, Alberta Branded, in the Federal Building at 9820 107 St. Edmonton. If you like the pictures on this website, contact me for any orders or inquiries. Keep visiting my portfolio for new work which will be posted as it comes.